This important book picks up where Dr Deepak Chopra left off in his pioneering work Ageless Body, Timeless Mind. 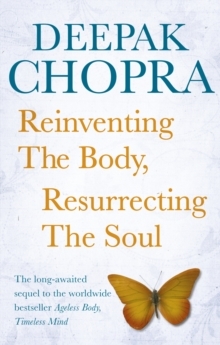 Having revealed the connection between our health and our thoughts, Dr Chopra shows us how to create a whole new self - the self we want to be - in this revolutionary sequel. Dr Chopra explains how the body is a reflection of the mind, 'a symbol in flesh and blood of everything you think and feel'. From early childhood each one of us has invented our bodies and our personalities through our beliefs, conditioning and responses to everyday stress. But we have mostly done this unconsciously, which is why we may now feel unfulfilled. Reinventing the Body, Resurrecting the Soul will help us to reconnect with our ideal sense of self, guiding us one step at a time through a remarkable process of renewal and discovery.